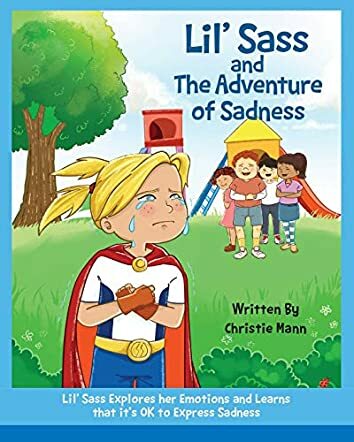 Meet Lil' Sass, a ten-year-old independent, clever and determined young girl in the storybook Lil' Sass and The Adventure of Sadness by Christie Mann. Her original name is Grace but her parents nicknamed her Lil' Sass, because of her adventurous and curious nature. She lives in Venice Beach, California with her mother after her father left them. Mrs. Moo, a wise old lady who is her friend, gives her a red cape after her father leaves them and tells Lil' Sass that she can explore and express all her emotions once she is inside the cape. Sass starts exploring her emotions with the cape and she realizes that it is okay to feel sad and even big kids and good kids feel sad. The author explores a topic that is not too often dealt with in children's books and she helps children understand that it is okay to express emotions and have a good relationship with their emotions. The illustrations are adorable and they give clarity to the author's words and bring the concept to life. The pictures also breathe life into the characters and the story. The questions at the end of the story make it a good book to use in classrooms for interactive sessions so that children will be encouraged to acknowledge their emotions, be these happy or sad, in a good way. The idea of 'Cape On' is charming and can be applied to children at home and school so that they can explore their emotions in a fun way. Storybooks like this are good for children as they are growing up to help them discover and feel their emotions in a positive way.